My main aim competitively was Gary Power’s stallion, PSH Twilight (Twee) competing at the Myerscough Regionals in the Novice Gold and Novice Freestyle. After a great prep run lesson from Judy Harvey and a Osteopath treatment from Jenny Froggatt we were all set. I was really looking forward to riding to my new music by Tom Hunt, it’s really powerful and emotional so perfect for a good looking black stallion. Davina Edney was on hand for grooming duties while Olivia Pack held the fort at home. We arrived at Myerscough in time for the arena walk. Twee was on good form. The first test for him was the Novice Freestyle Gold. He warmed up well but was a little nervous in the arena – but as the test went on he started to breath and get more confident. 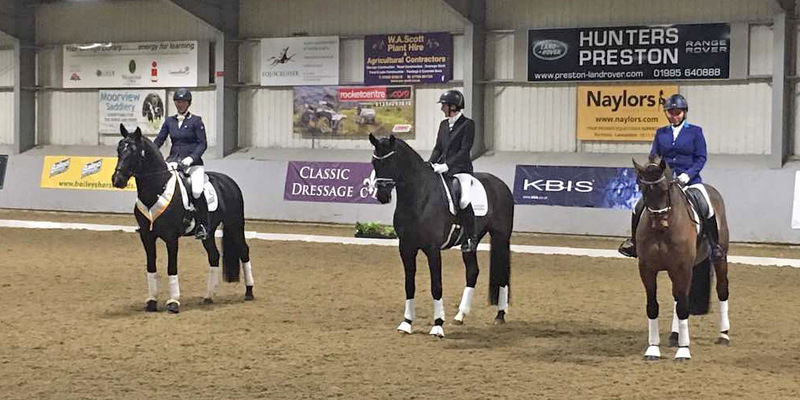 He finished with a score of 74.8% which meant he gained his qualification for the championships, winning his section. We had a great time going out for dinner with Gary and his team and staying with Sue Stewart. Not being on till the following evening meant Saturday was rather chilled. I took Twee for a hack with the whippets and then Sue joined us for lunch in the lorry and we had a lovely afternoon catching up and watching racing. It was made even more special as it was our first trip away in our new Cooke Horsebox. Jemima, as she is called, behaved impeccably. After having spent the day in a rather chilled mode, I felt it rather strange to get into competition mode, but as soon as we got in the lorry to go back to Myerscough I was back in the zone. So was Twee. He was much more relaxed than the previous day and felt full of confidence as soon as we went into the arena. I was so proud of his test and he scored a fantastic 77.3% which was a great score and enough to win his section with the highest mark of the whole show. I’m so proud of Twee throughout his first stay away party. He really is such a special boy and I’m very excited about his future. Roll on the Winter Championships at Hartpury in April. On the training front things are busier than ever. Both teaching at home and away to clients premises. It’s exciting to have more and more new clients and watch my long standing clients progressing so well. I was very proud of Sarah Pickford and Flabbergasted winning the Novice Freestyle silver at Myerscough. Off back up to Scotland on Wednesday, training. Really looking forward to going back up north!! Meanwhile on the Eventing front. Polly Stockton is getting on very well with Mister Maccondy and they are all set to run at Isleham this weekend. Looking forward to cheering on Team Stockton.